Garden Bloggers Bloom Day - Special April "Rules"
This has indeed been an unusual spring around here and everywhere. I'm kind of afraid (not quite ready) to actually go outside and look closely at my plants and flowers as I'm not sure what I'll find after what seems like night after night of below freezing temperatures after that big warm up in March. Plus, it is still cold out there, as in 'winter coat" cold. Like a lot of people, I thought I'd put my winter coat away for the season a few weeks ago, but I had to get it out again on Friday, along with my gloves. Ugh, it seems so heavy! There are some bright spots, of course. There are always bright spots in every garden! 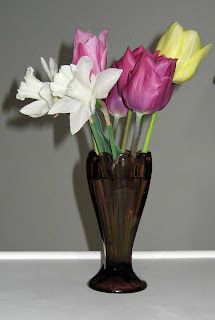 I picked a few tulips and daffodils early Sunday morning while they were still kind of frozen, put them in a vase, and they opened up quite nicely. But there are some cold-related issues in the garden that I'm going to have to face eventually, once things warm up. 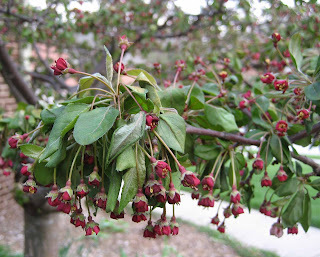 Like what's going to happen with these crabapple blooms? I see this tree every morning and it seems to droop a bit more each day. I don't hold out much hope of it blooming like it did last year. Geez, it is just full of potential buds, too. What will I have to post about on Garden Bloggers' Bloom Day for April, which is coming up on this Sunday, the 15th? I think everyone knows how this bloom day works, as this will be our 3rd month to do it, but for those who don't know, here's the run down. On the 15th of the month, go out into your garden and make note of everything in bloom (or the top bloomers) and list all your blooms on your blog. Pictures are optional. The idea is to compare from north to south, east to west, and from across the ocean, what is blooming where. After you've posted, come here to this blog, and I'll have a post where you can leave a comment so everyone can find you. Easy, right? Many of us were so eagerly anticipating April's Garden Bloggers' Bloom Day, especially after that warm up in March. We were going to have lists galore of blooms because it is finally spring, and we still might, because we have to remain optimistic. You can never tell what plants will do, given a day or two of warmth! But just in case the plants don't make that much progress after being frozen for a week, I've got some special one-time "rules" for April. If it is just real bad in your garden, or if it is still cold, or you just can't face your garden by this weekend, go back through your pictures and garden journals from last spring and tell us what would have been blooming if winter had not returned in April. 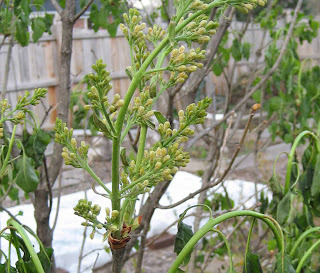 Or tell us what was just about ready to bloom before it was frozen out and show us a picture or two. We'll visit and offer sympathies and make a nice comment about what might have been and talk about how wonderful May will be. Because May is our favorite gardening month around here. Did you know that? This evening, since I had to go out and water the pansies and violas and had my coat on anyway, I got up the gumption to look around the garden to see what was going on. Below is my apple tree. It's a Red Delicious (I think). I can't tell if these buds will still break out and bloom or if they are frozen. Anyone know from the picture? I did read a story about a local apple grower who estimates he lost 50% of his apple crop and the other 50% isn't going to be worth much. His family has had their orchard for 80 plus years and he wonders if it is all worth it, when something like this happens and pretty much wipes them out for the year. I hope they stay with it. They also sell produce in the summer, which should help some, I hope. 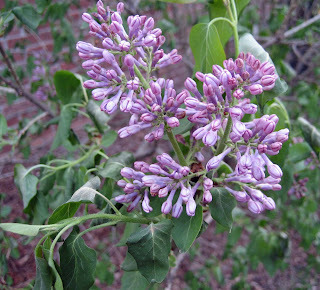 This is a common lilac (Syringa vulgaris) in my neighbor's side yard, over by my yard. The leaves look bad, but I wonder if that flower is still going to bloom. It looks nice and bright, but I've noticed several flowers look brigher when frozen in time. In contrast, I don't hold out much hope for my white-flowering Lilac (Syringa vulgaris 'White Angel'). The other lilac is in a more protected location between our houses. This white-flowering lilac is out in the open. It is supposed to warm up this week, could be in the high 50's, low 60's by Friday, and tonight is supposed to be the last night of below freezing temperatures for awhile. Perhaps we'll soon have our spring back! But if spring is slow in returning, we will have the Garden Bloggers' Bloom Day "special one time rules for April" to help us through it all. blooms on the 15th! Great idea I look forward to it!Hope I don't forget! I've been doing my garden bloggers round today and find that many have been hard hit by snow or frost or both. So far the weather has been very mild over here so I feel very lucky. Good idea those special rules for April, that way all can put some nice pics on their blog and not feel left out. In the Netherlands fruit growers spray the blossom on their trees with water so that the blossom will freeze when there is some late frost. After the frost is gone, the blossom will emerge undamaged. The ice keeps them safe. My plants made it through the last freeze but I had to do a lot of work to help them. I hope that was it for the cold weather this year. I have never seen my crabs bloom, as they were put in last summer, and I am so worried I won't see them bloom this year! I can't even get the raised beds filled because the contractor won't bring dirt until it warms up and dries out!! Is that row cover on your raised bed?? We have had similar reports from local fruit growers--mostly those in Akron and areas south of Cleveland, actually. 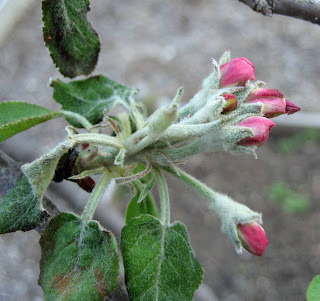 Luckily, spring tends to come later to those of us who are closer to the lake (the lake mitigates the temperatures) so I don't think my apples or cherries were even close to blooming yet. We shall see. Like you, I kind of dread what I will find when the snow melts. NatureGirl... I'll post another reminder, so you won't forget! Yolanda Elizabet... I think some fruit growers have done the same with ice to protect blossoms. Trouble is there isn't enough warm up. Gardener Greg... I hope the cold is moving on, too! Sissy... Yes, that is a row cover to keep the rabbits out of the lettuce and peas, and it is also protecting them from the cold. Hang in there, this cold won't last. BlackswampGirl... I am thankful we didn't get snow, just cold. I'm amazed that your lilacs and apple trees were about to break into bloom. Mine are still very tight buds, even though my garden's been way ahead of yours the previous two months. Last year we lost all the peach blossoms from a late hard frost. This year the trees are just loaded with blossoms. I'm going to be thinning fruit like crazy in another month or two. I will be interested to see everyones blooms from last year, But I think it's really interesting to see what is happening now, even if it's depressing. It's interesting to see what makes it and what doesn't, like your tulips. It's fun to see how tuff they are and how they just stand tall and beautiful in the face of the adverse weather. This was just a really challenging spring! I haven't fully assessed my damages yet. Your blooms were far ahead of mine- maybe because I'm rural and it takes a lttle longer warming up here...??? I hope the crabapple begins to look a bit better and that your weather warms up!